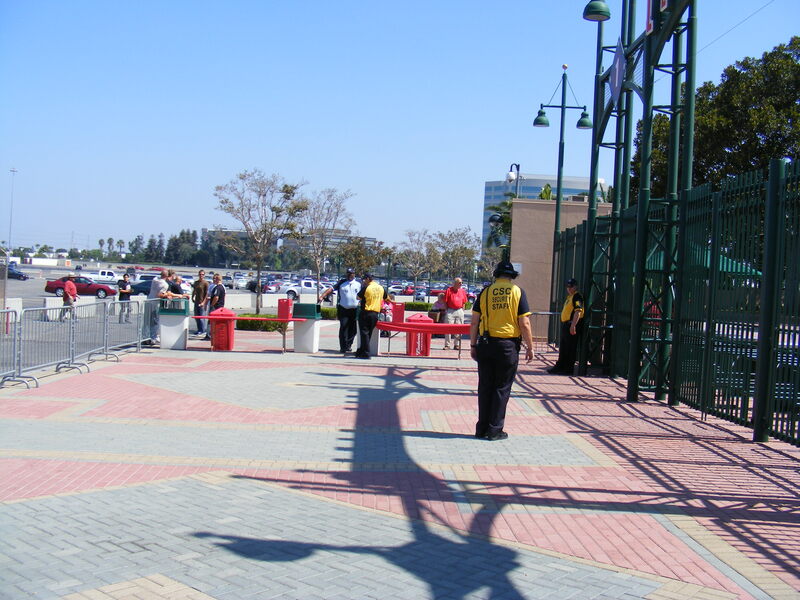 baseball.” It was a gorgeous summer day in Orange County. 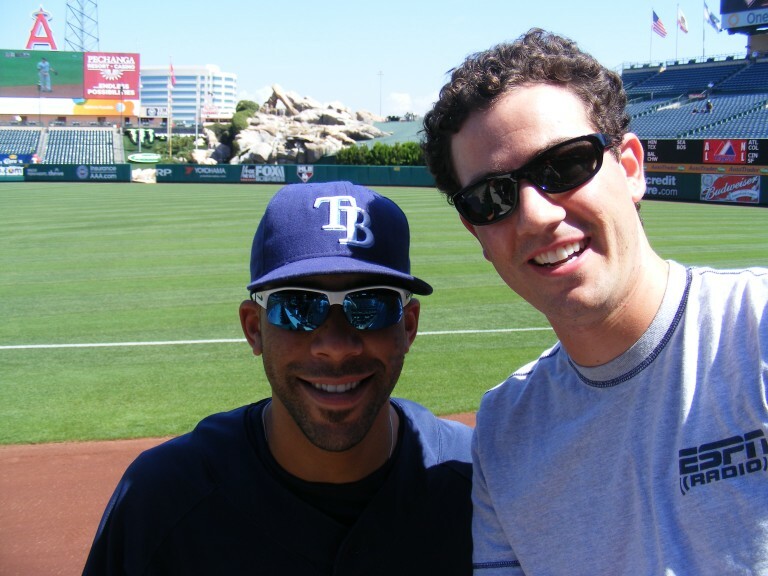 Scavenger Hunt by getting a photo with All-Star pitcher David Price. 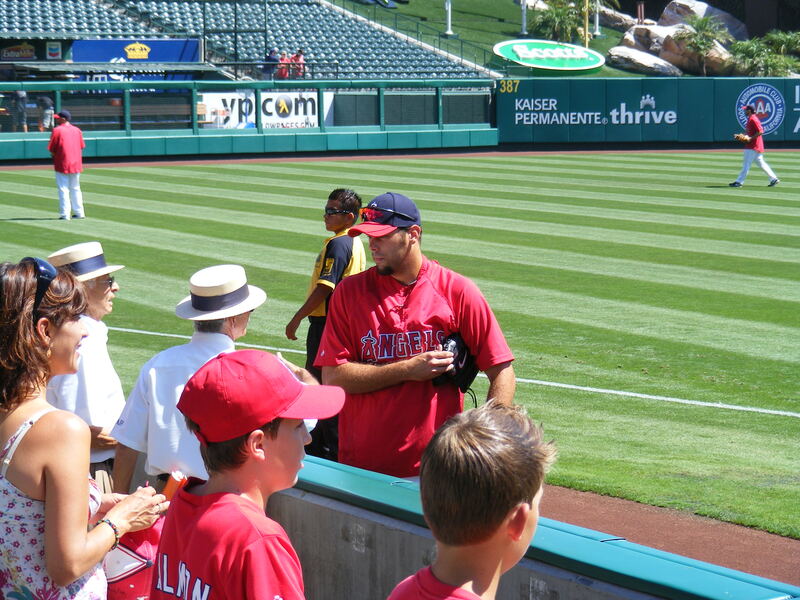 great, there weren’t many fans, and I was able to get a few more autographs. got him on a ticket stub. 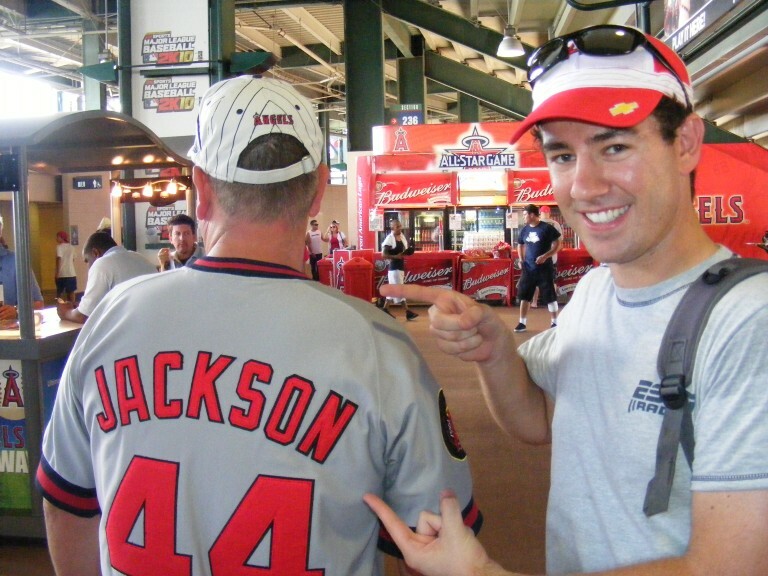 guess he’d handed over to someone at some point in the autograph process. 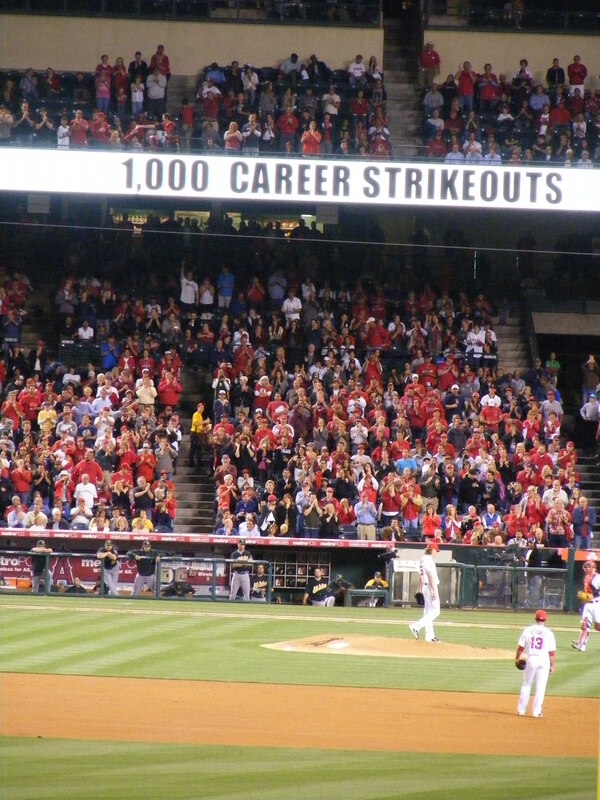 to be, but he’s been a good, solid pitcher for the Angels since 2002.
preparation for the players to emerge from the dugout, I assumed. me. 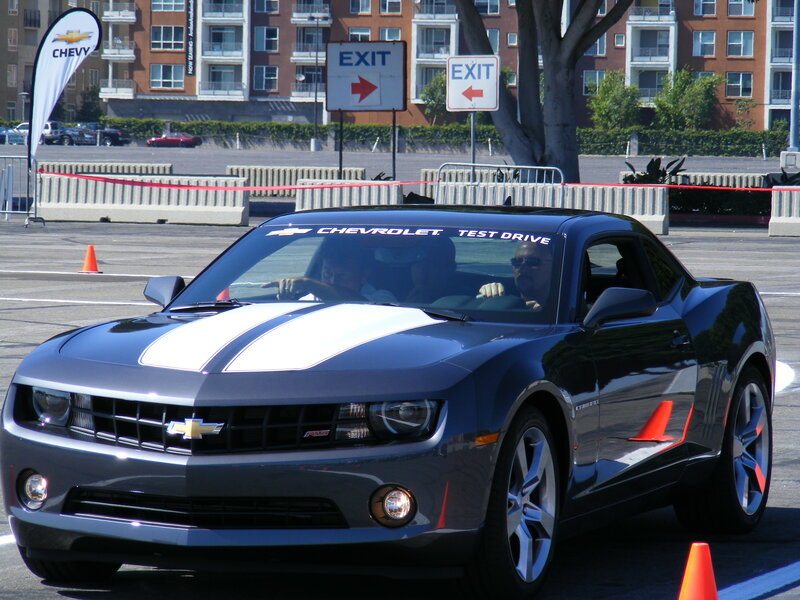 Anyway, he was pretty cool and I liked his shades. 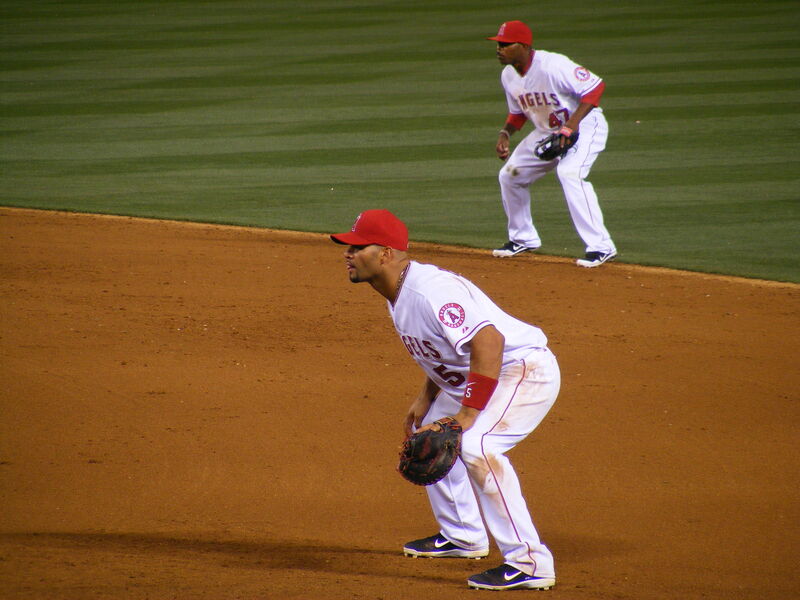 lean just slightly to the left in order to catch it. I took a photo (right) of the spot where I made the catch. ball at each one. That streak goes back to September of 2008. 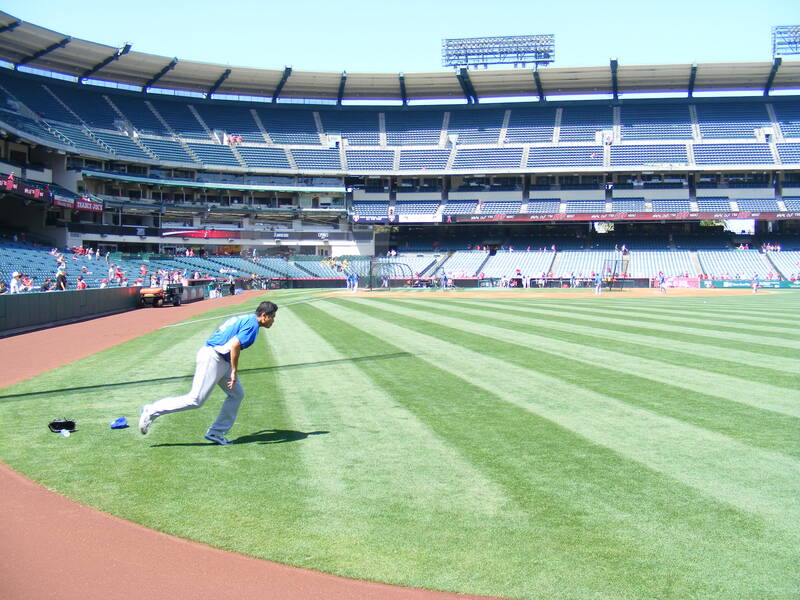 I went back over to the Rays’ side as their players were warming up. 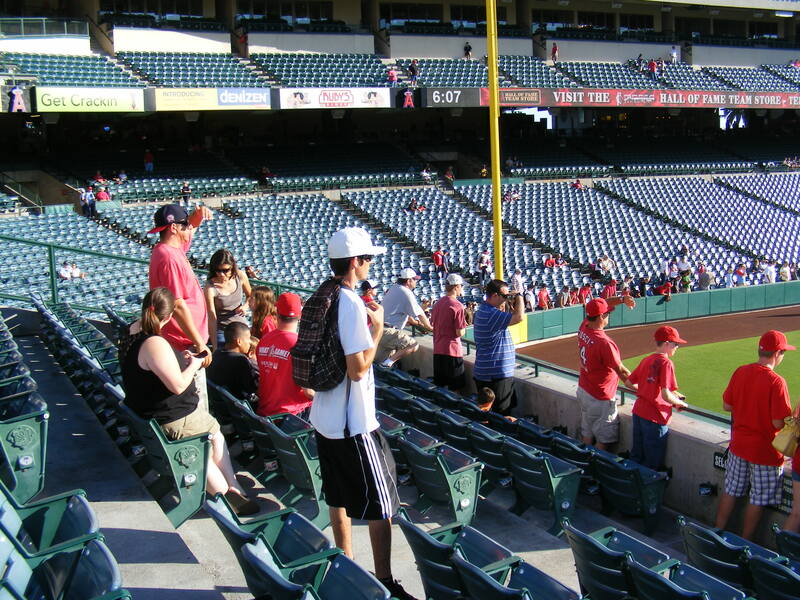 There, I took a picture from a different angle of where I snagged the Callaspo ball (left)… you can see how that special section of box seats separates fans from the field and players. 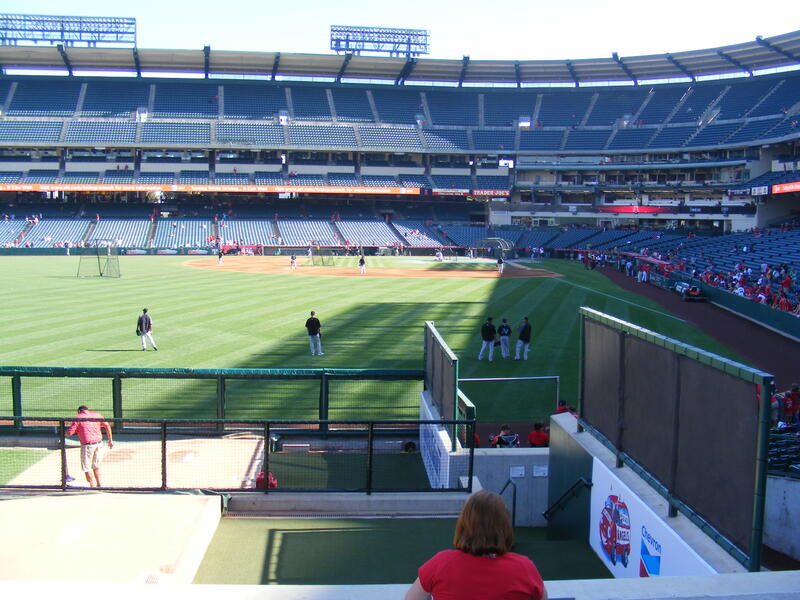 So, I was in the first row of the non-box seats… which is technically the second row. I didn’t snag another ball or autograph from a player but I did get a baseball tossed to me from coach George Hendrick. I decided to keep the Callaspo ball and give away the Hendrick one. 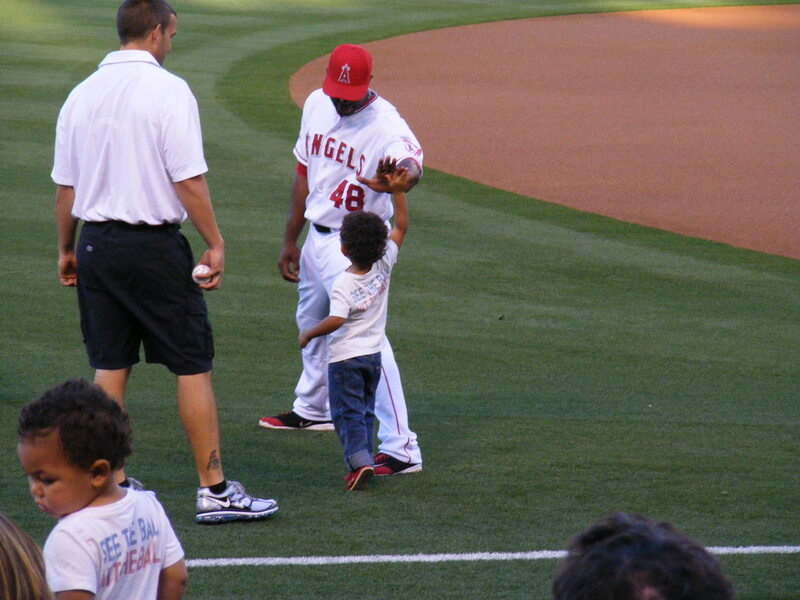 I found a little kid nearby and made his day (and his dad’s). They were thrilled to receive it. 1. 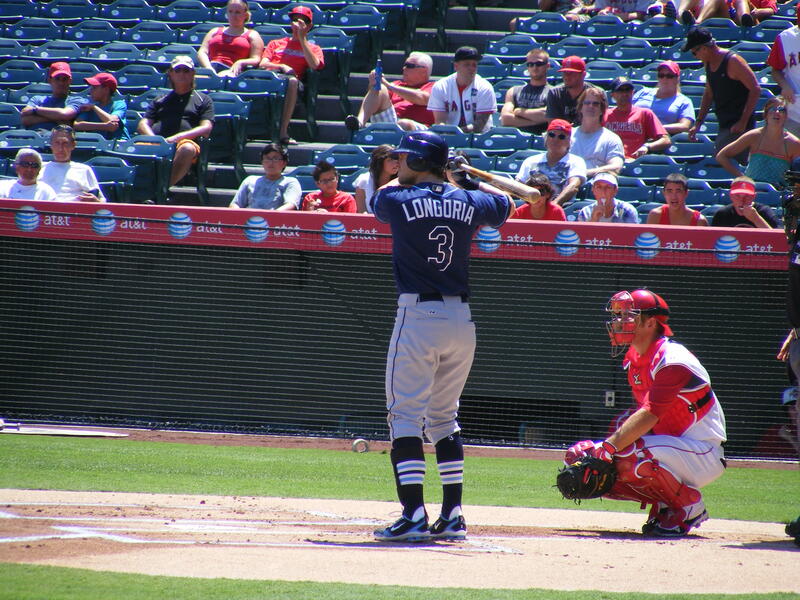 Check out Longoria’s socks. 2. 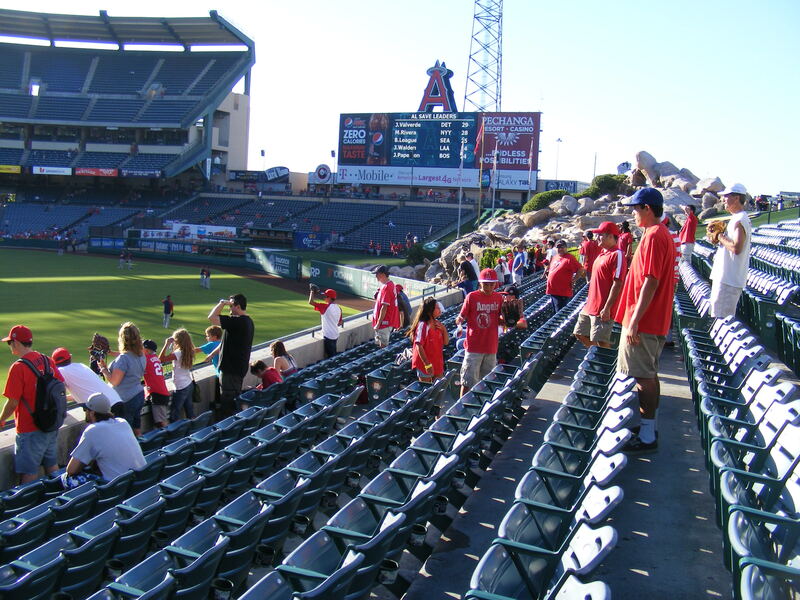 Check out all the empty seats! 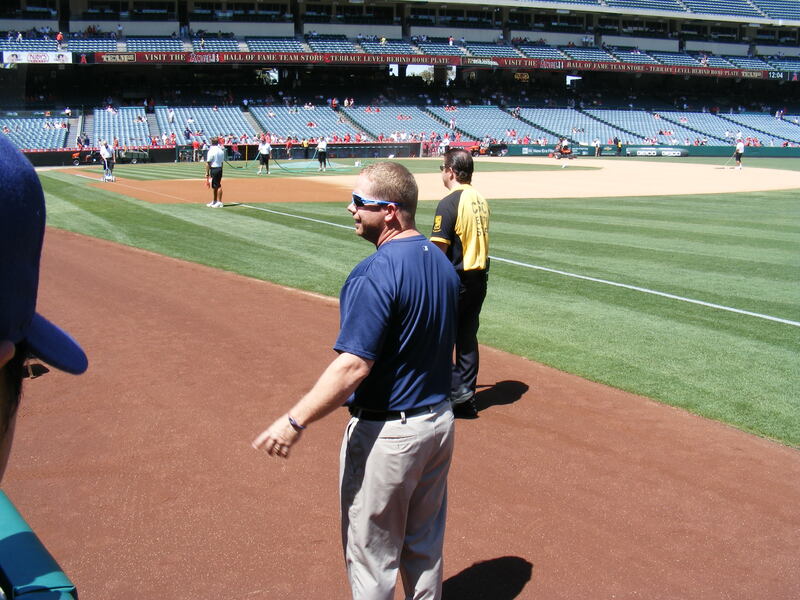 And I spent the bottom of the first behind the Rays’ dugout. 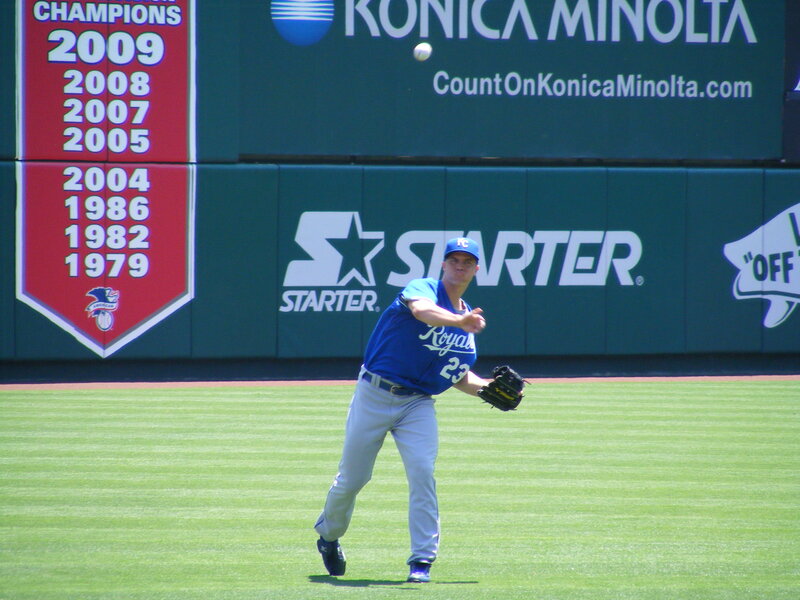 I saw BP regular Rob out there in the stands and he and I chatted throughout the game. No homers got hit out toward right field but Mike Napoli did hit a grand slam to left field. 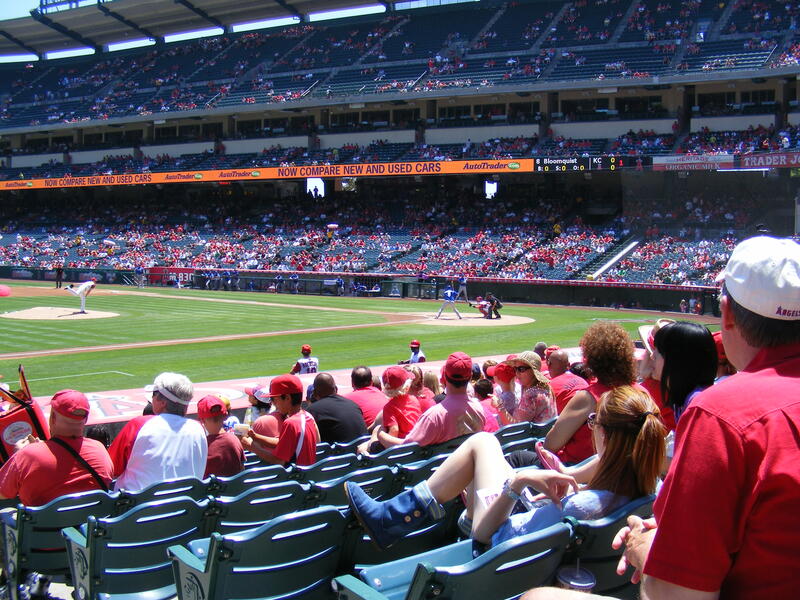 The Angels would crush the Rays on this afternoon, 12-3. Their offense decided to wake up, how ’bout that? Also, I watched as a fan who was sitting about four rows from the field down the right field line got nailed by a foul ball. 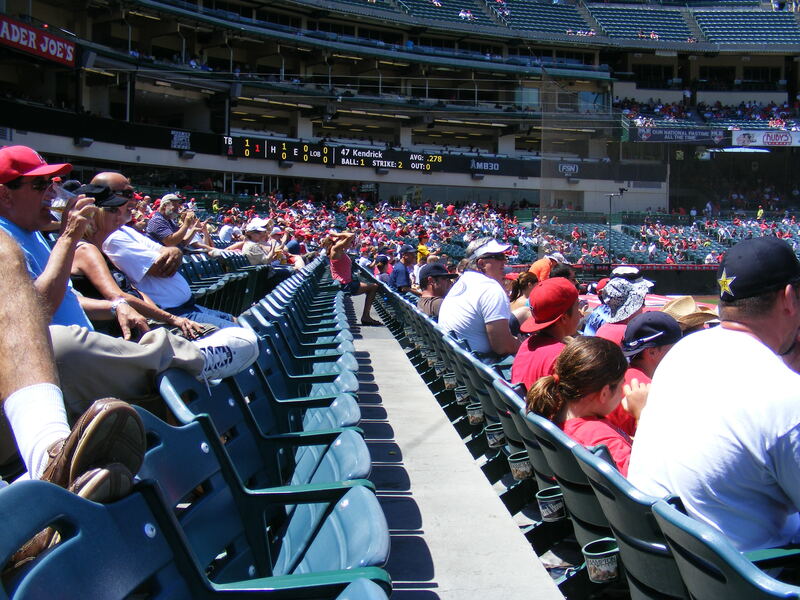 It wasn’t a scorcher that took a hop into the seats or a line drive that he didn’t have time to see. 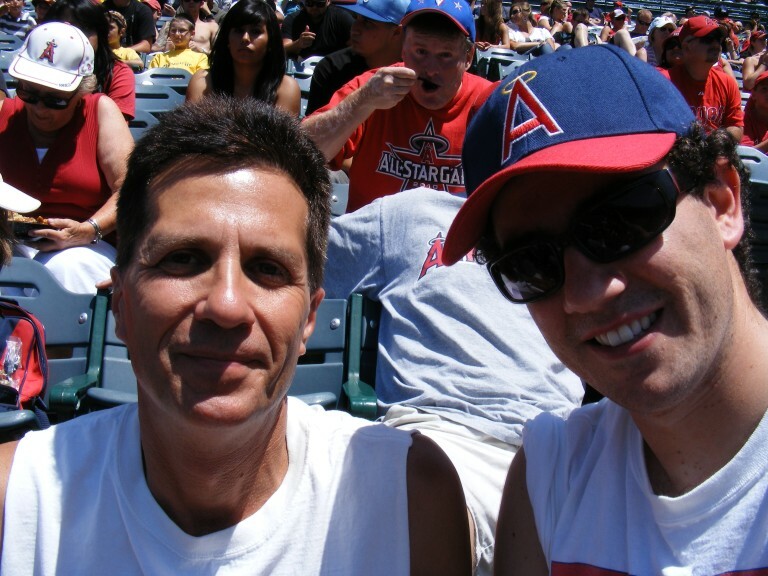 It was a fly ball that Rob and I watched, I knew it was going foul. A half a dozen fans moved out of the way of it. This one guy did not. He’s down on the ground in that photo… being tended to. The woman in white bending down is pretty much blocking the guy that got hit. Rob and I saw it and heard it hit him. That sound… I guess I should’ve felt bad for him… or sympathetic. 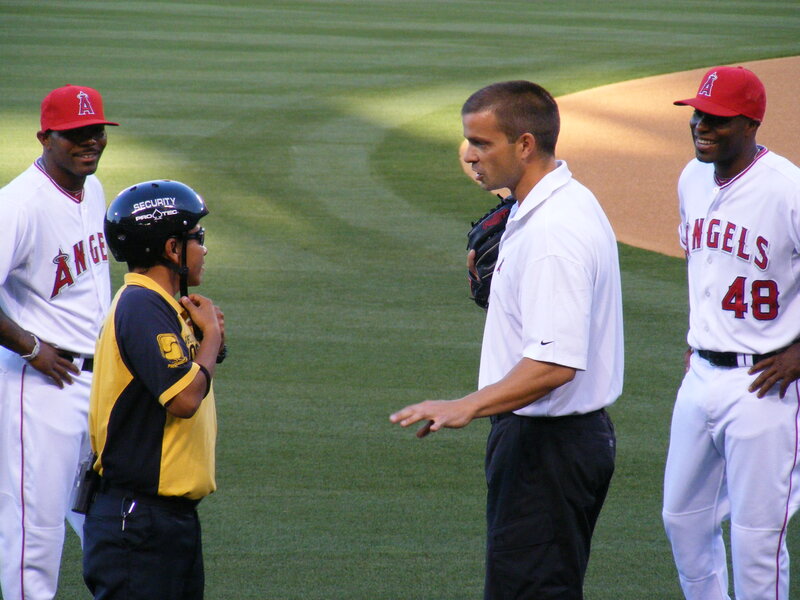 But I just kept thinking, if you’re that close to the field: PAY ATTENTION! He got taken away by paramedics after a few minutes… he walked up the steps under his own power so I imagine it was just a bad bump on his head/face/leg/arm. Wherever he got hit. 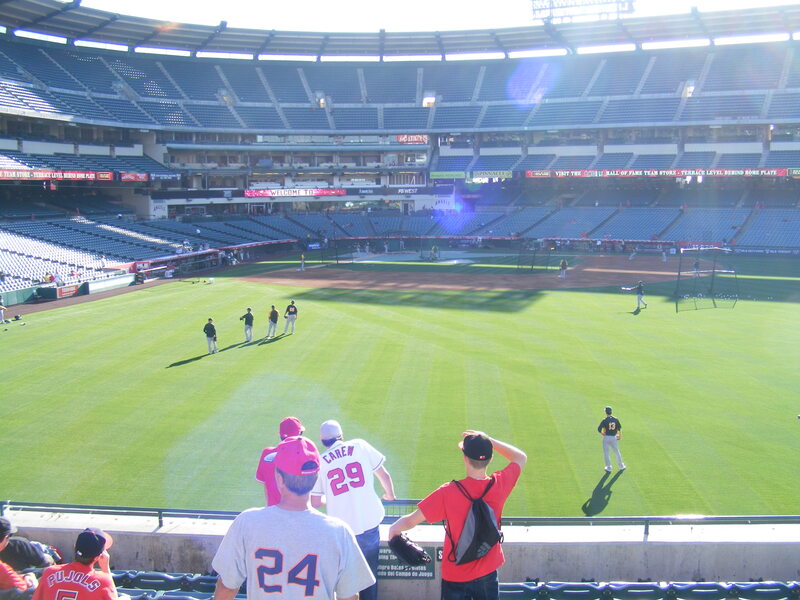 So, I got some sun, a couple of baseballs, five autographs, and saw the Angels win. All in all, it was a good day. Toward the end of the game I tried to snag a ball from the bullpen guys… but failed… also I didn’t catch a home run in left field either. 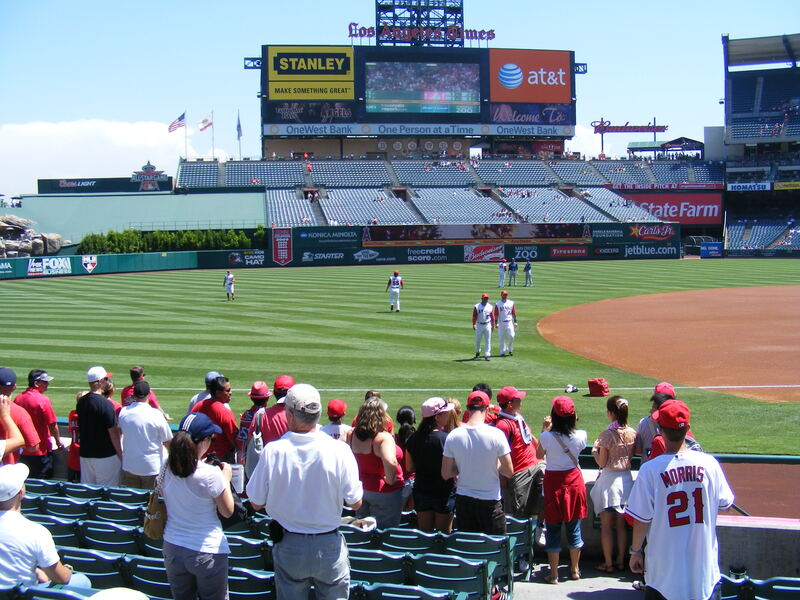 I saw a fan wearing a Reggie Jackson Angels jersey–more scavenger hunt points. Note: I actually have that jersey but mine’s the home white and not the road gray. Hi, readers. 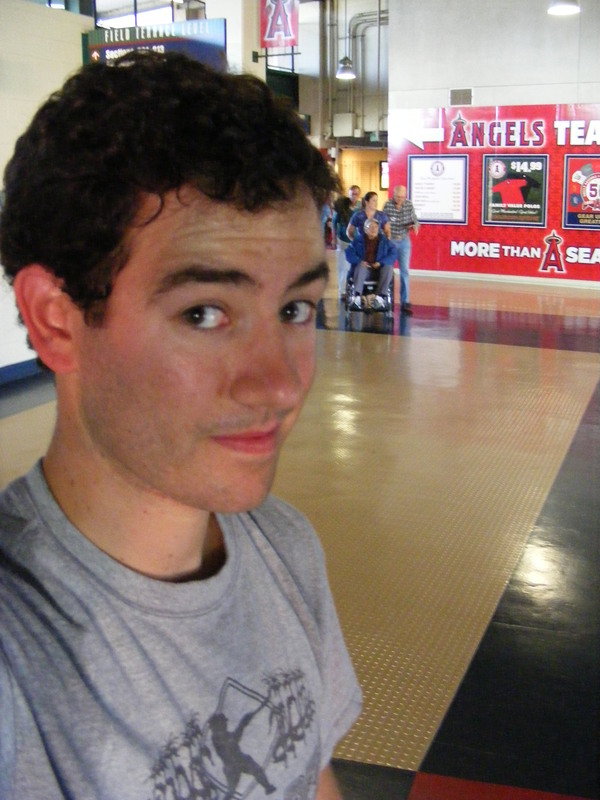 You may know by now that I was fortunate enough to attend a game at Dodger Stadium with an all-access media pass on August 19th. Well, Alan Schuster of www.mygameballs.com got the whole thing set up for me and I attend the game with the goal of interviewing fans that snagged souvenir baseballs. The article went live on the site last week and I’ve decided to repost it here for the MLBlogs community. It was published in three parts on myGameBalls and I’ve broken it up into those three parts for this entry, too. Enjoy! Going To Do With The Ball? 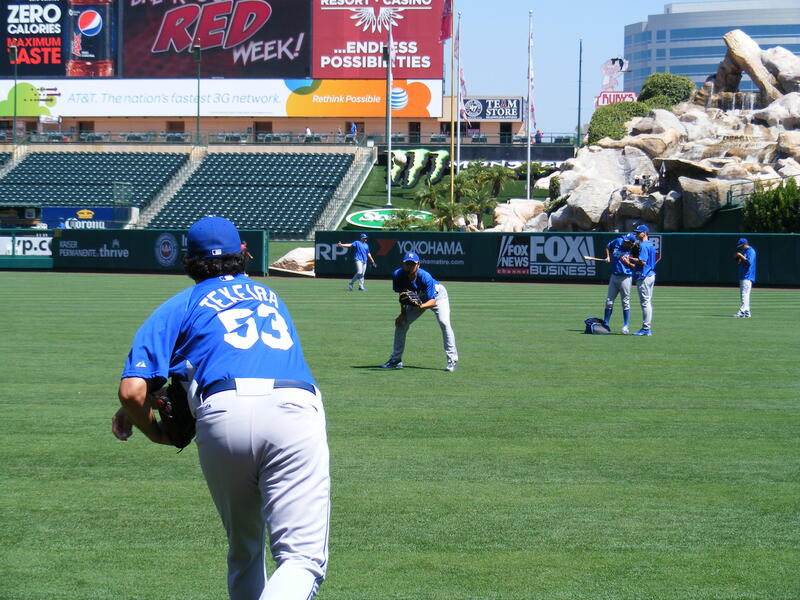 the hometown Boys in Blue take their batting practice swings in the cage. 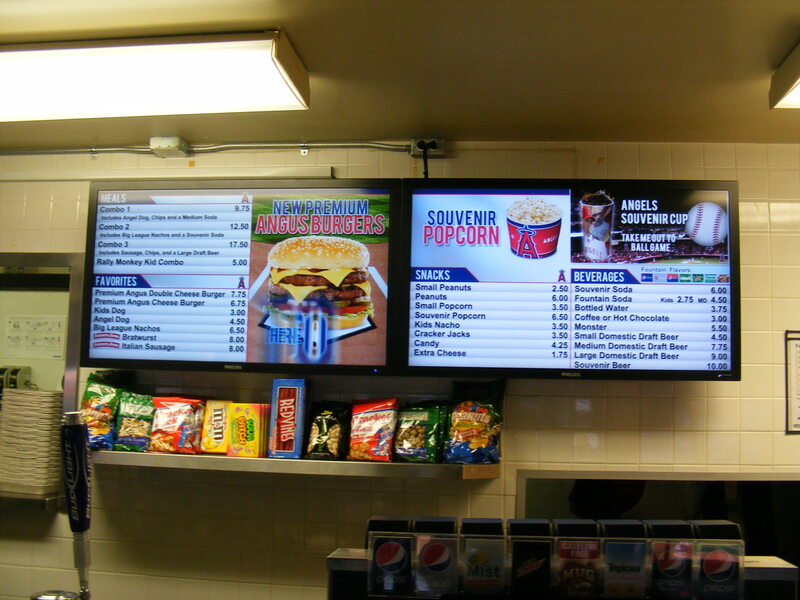 open in twenty minutes and I think to myself, The first fan in the gates is going to wind up with a nice souvenir. 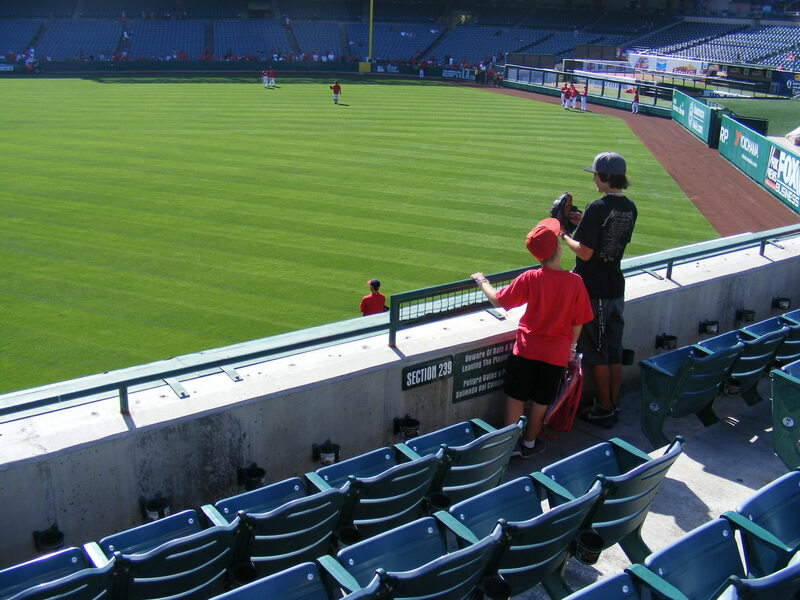 I watch as a few more BP balls wind up in the left and right field bleachers. One more bounces into Mannywood, this one ends up in the second row. 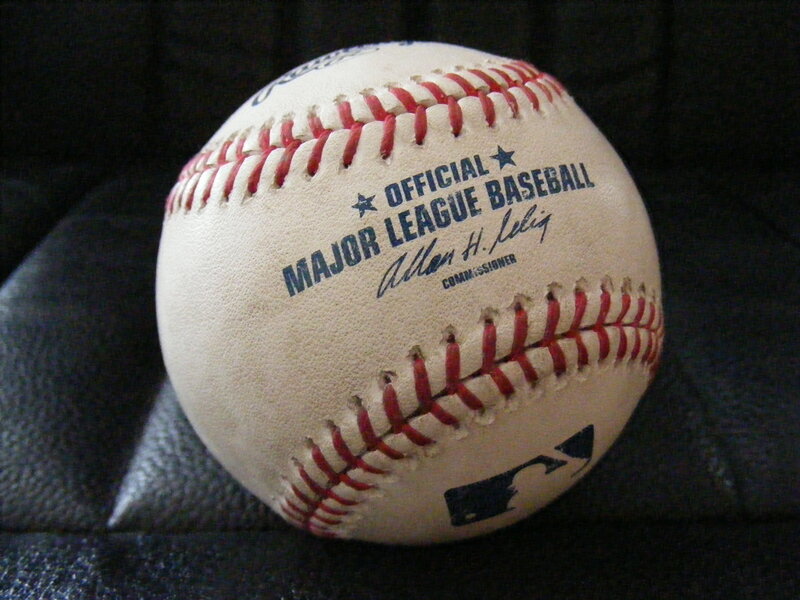 home a piece of the action: a Rawlings Official Major League Baseball. 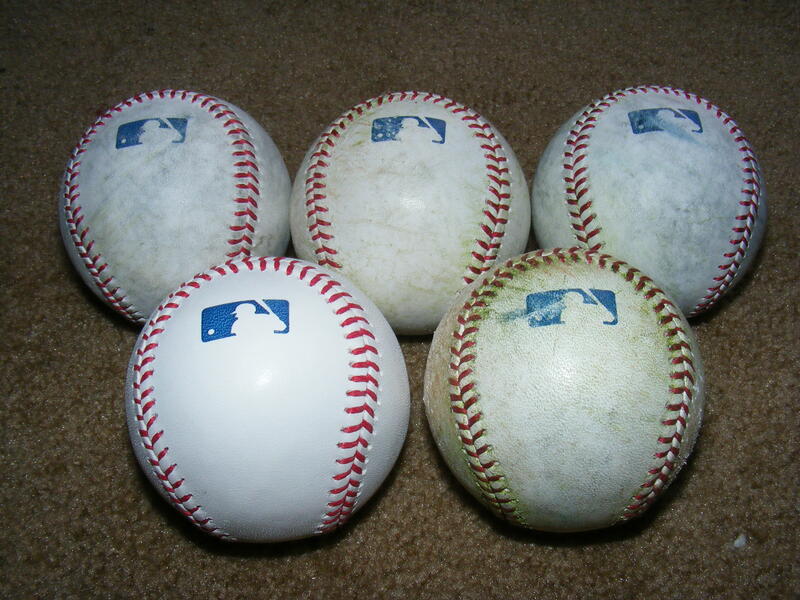 pick up four or five balls. Dodger Stadium is open for business. 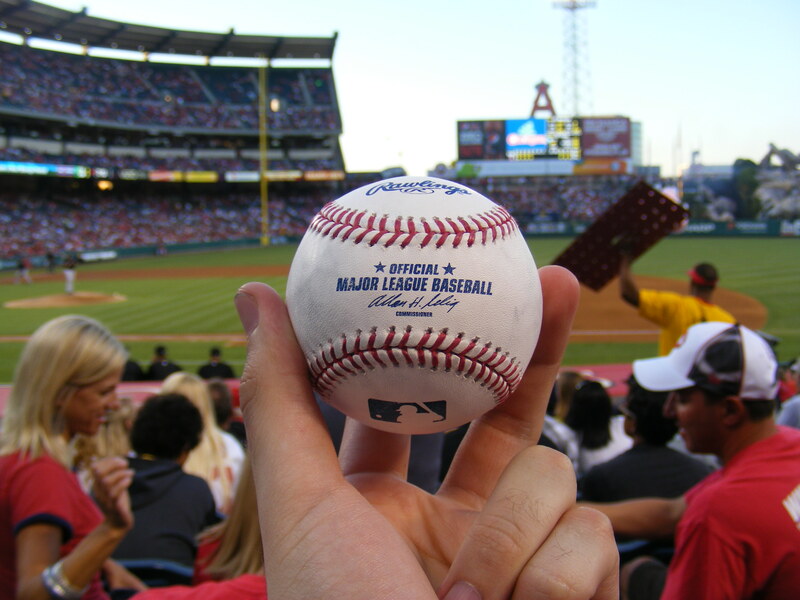 fans to get a ball from a game, maybe even from their favorite team or player. still talking about the ball, both grinning from ear to ear. well, but he’s losing, 2-0 because Lilly is dominating Colorado. mid-eighties), Lilly is keeping the Rockies off balance. wonder in his voice he says to me, “Like, it’s really here? You know? him.” A fine answer, Cory. Well done. 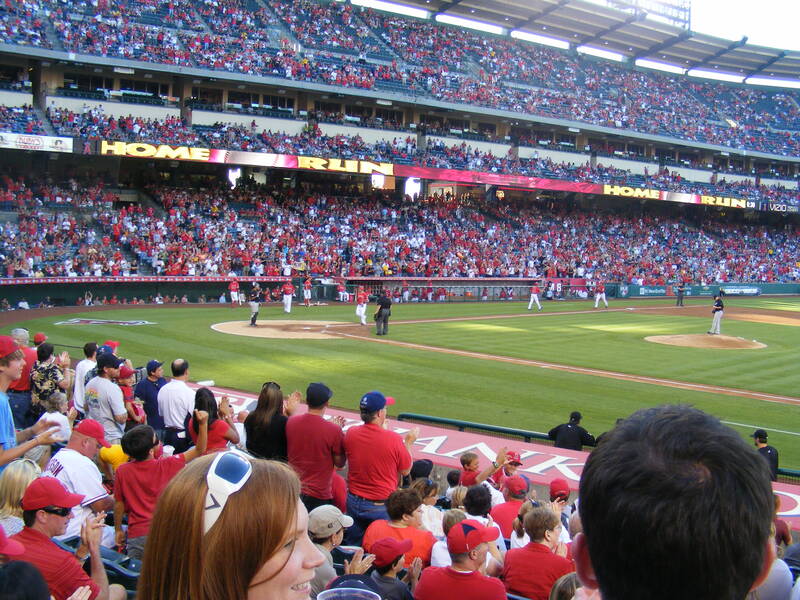 anyone specifically avoid a foul ball that rolled to their feet? No. 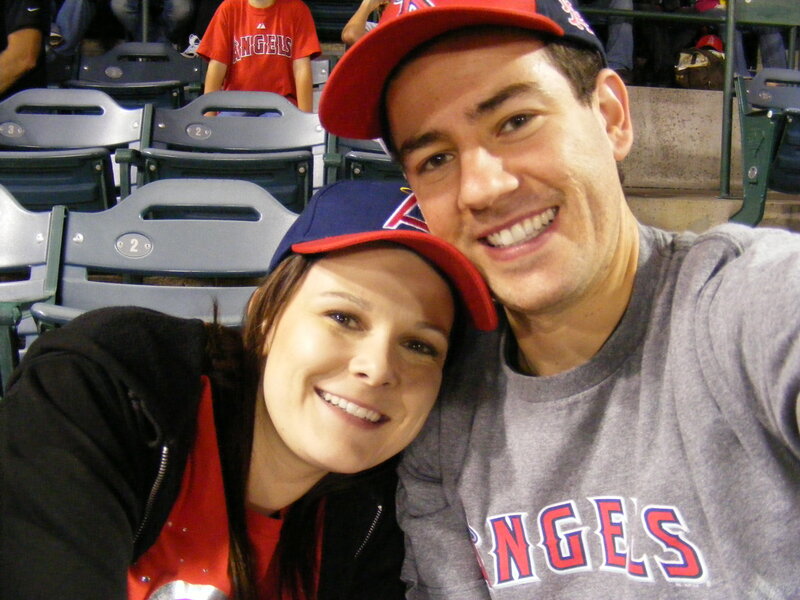 and strategy go a long way in procuring a baseball for a couple more fans. lives in L.A. and is originally from Napa. he’s got flowing through him. Joy? minutes later. He’s letting it sink in. 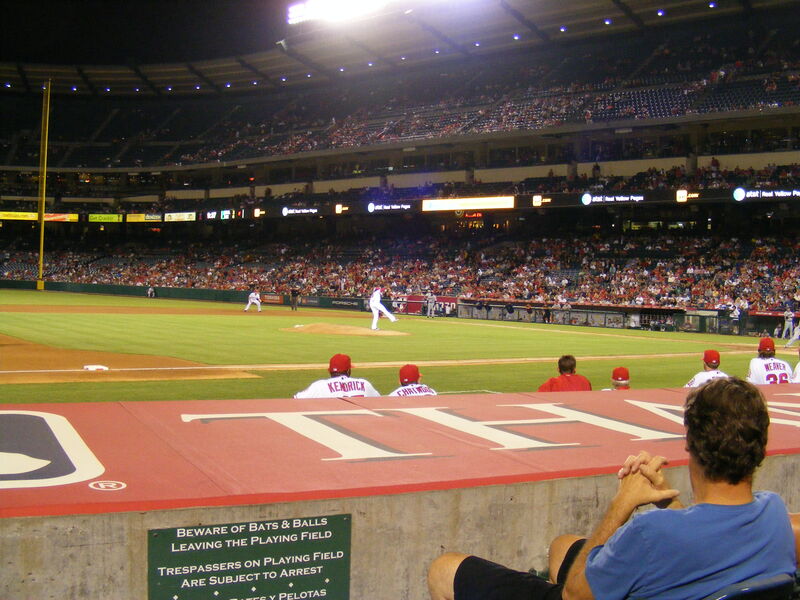 right field bleachers in the fifth inning. luckiest people in the stadium. firsts on this electric night of fine pitching. 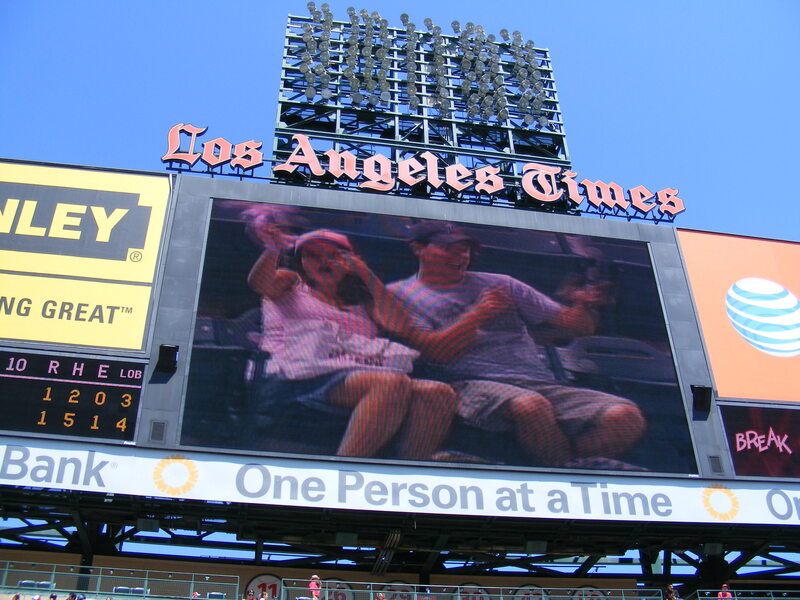 international Dodger fan, Mr. Kuei-Fan Liu, visiting L.A.
forever in their memories, even half a world away. So, Mr.
Liu, what are you going to do with the ball? Put it on the mantle, in a trophy case? think… what’ll you do the next time one comes your way? 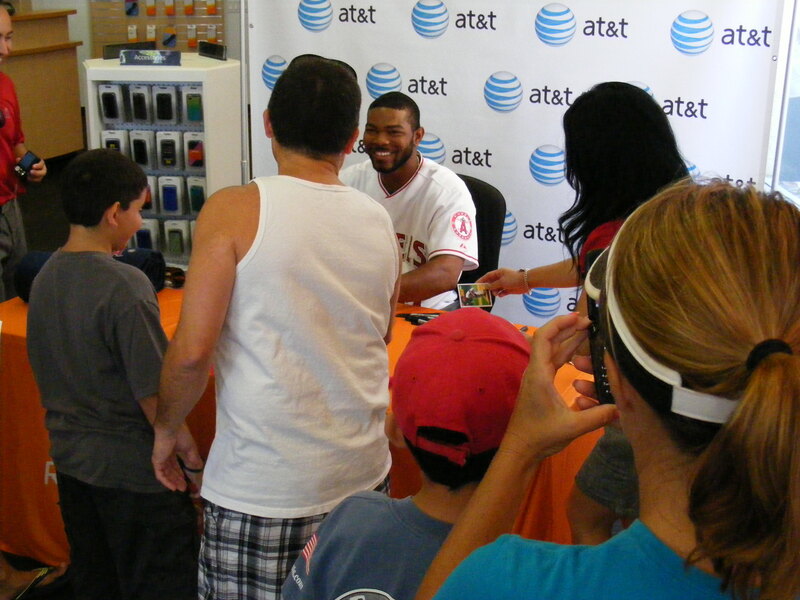 The day began with an autograph session with Howie Kendrick at an AT&T store in Seal Beach. 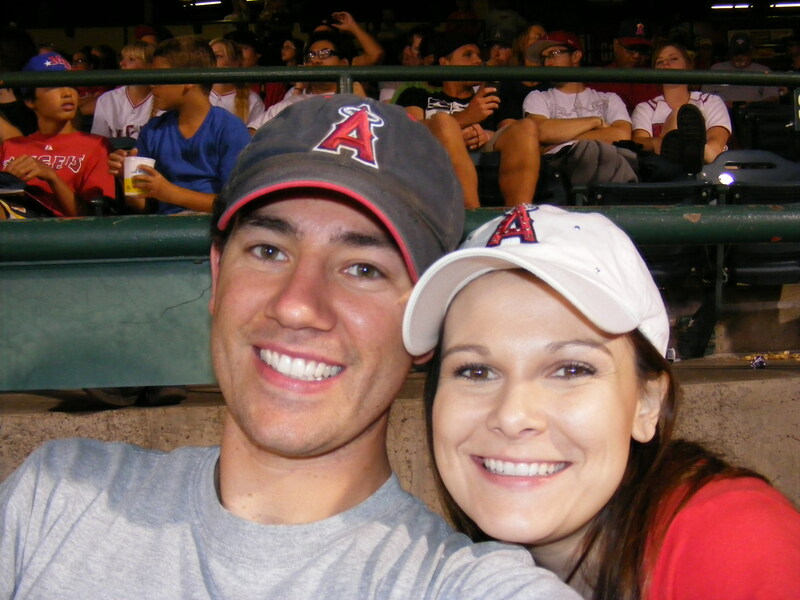 Michelle and I each got him twice, and I knew I’d be giving one baseball I had signed away to a friend of mine who works for a charity to fight Huntington’s Disease. Howie was very nice in person and I really liked his shoes… we chatted about them for a minute as he signed my second autograph. Thanks, Howie! We ended up with free tickets to this game thanks to Michelle’s uncle, Joe, who met us in Irvine with his son and then we all drove to the game together nice and early for batting practice. 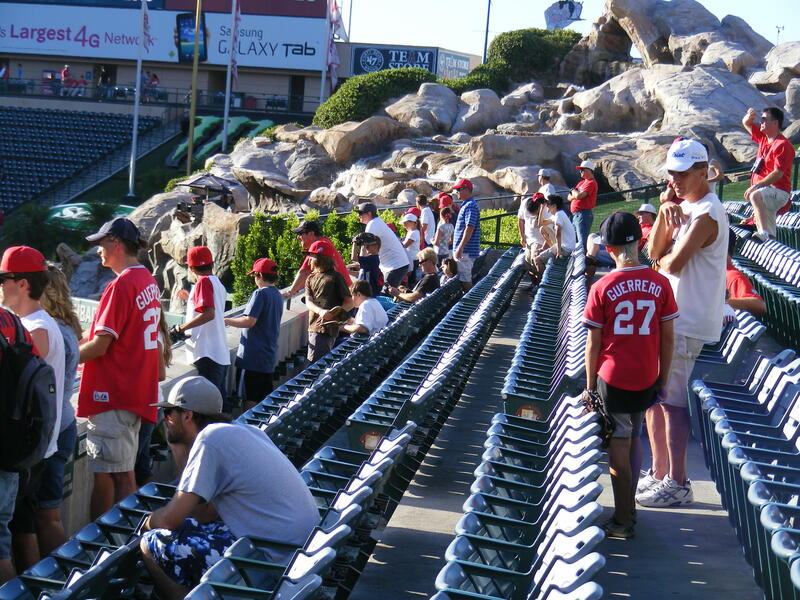 They all decided to check out the animal adoption booths (which you can see to the right in the above photo) while I headed in for BP. 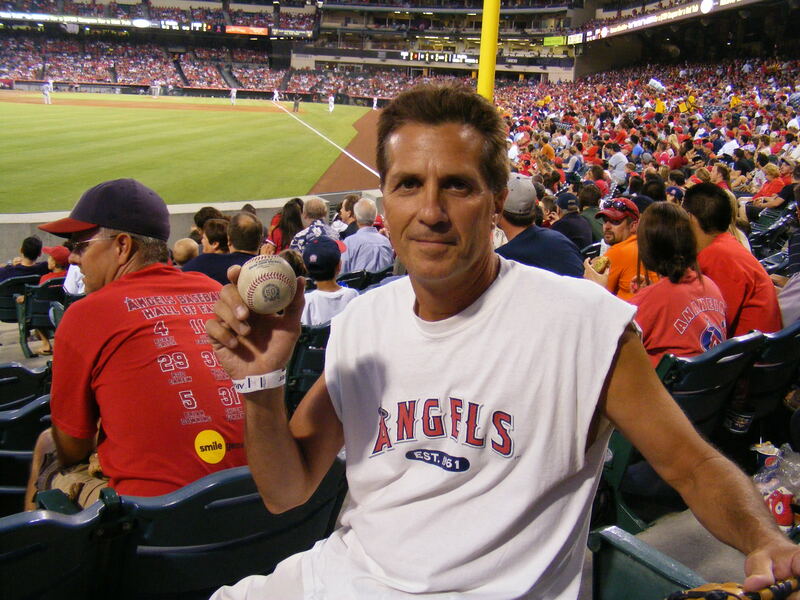 My first ball on the day was a scoop off the warning track. 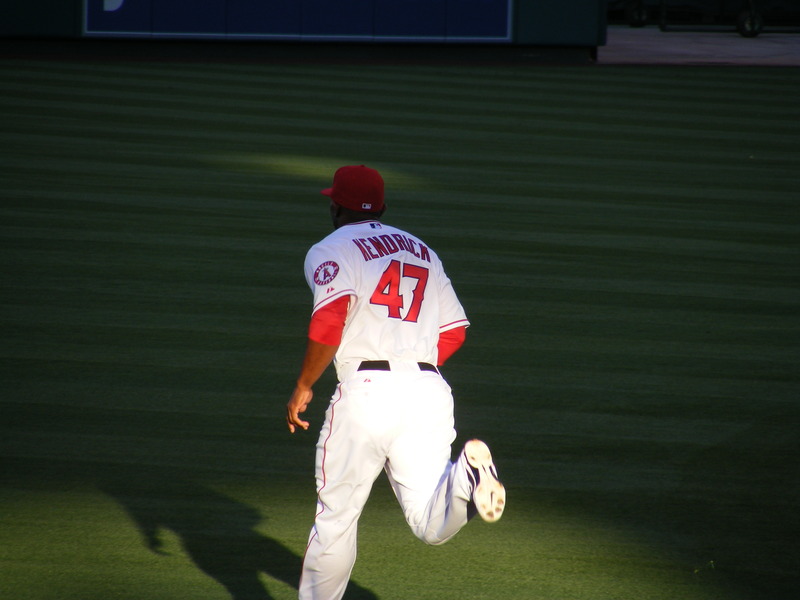 Kendrick sliced one that bounced on the grass near the foul pole and I was able to jump out over the wall and snag it as it rolled by. It had the word “PRACTICE” stamped on the sweet spot. Bleh. The kids in that photo were pretty excited on my behalf… they hadn’t even seen the ball coming and I snagged it three feet to the left of the smaller boy. It was a pretty nice snowcone catch–again, the ball had a practice stamp. 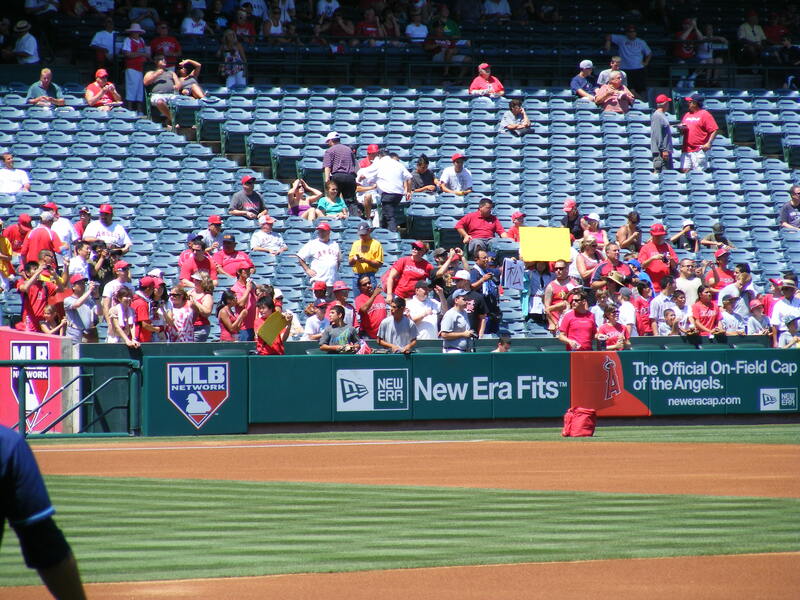 That was it for Angels BP. 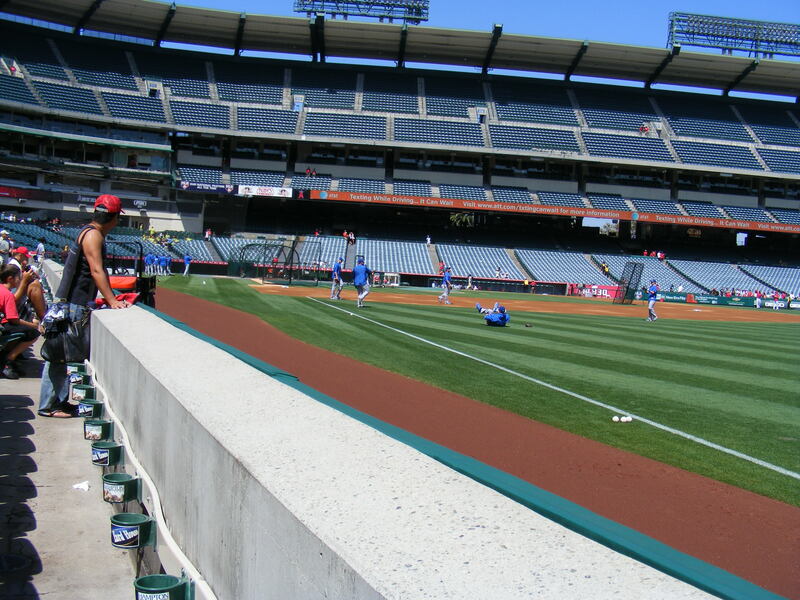 For the Blue Jays, I played the area behind the bullpens in left field. I knew there was a lot of right-handed pop in the Toronto lineup and I hoped that they’d knock a few out that far. 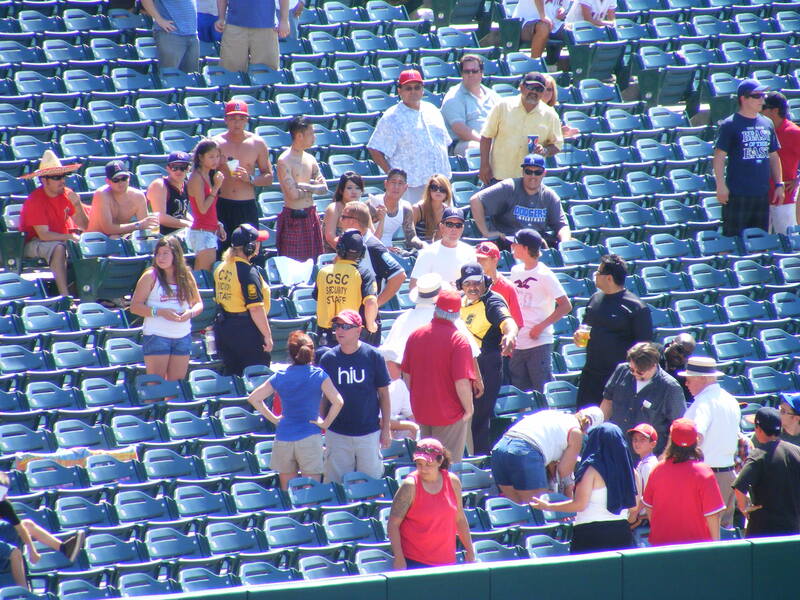 Most of the home runs they hit went into the bullpens–but thanks to Casey Janssen, a SoCal native who was talking to the woman in the red shirt in the above photo, I got Ball #3 on the day. A Blue Jay righty (I don’t know who) smacked one toward the bullpen. 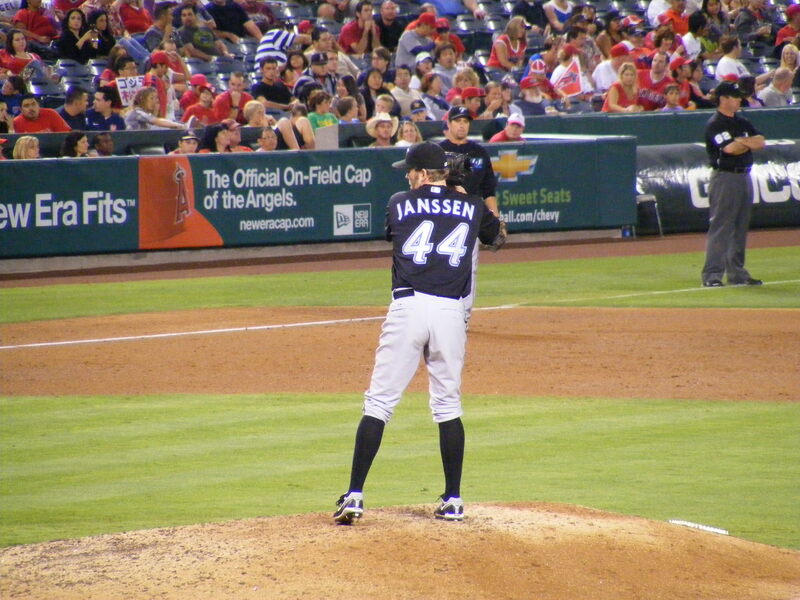 I yelled to Janssen, who was in the ‘pen, “Heads up!” He turned, found the ball as it descended, and caught it. He’d already given one to the lady he was talking to so, as a way of saying thanks to me for warning him, he flipped me the ball. The toss-up was, if my records are correct, my 100th ball of 2010! Many thanks to Mr. Janssen. 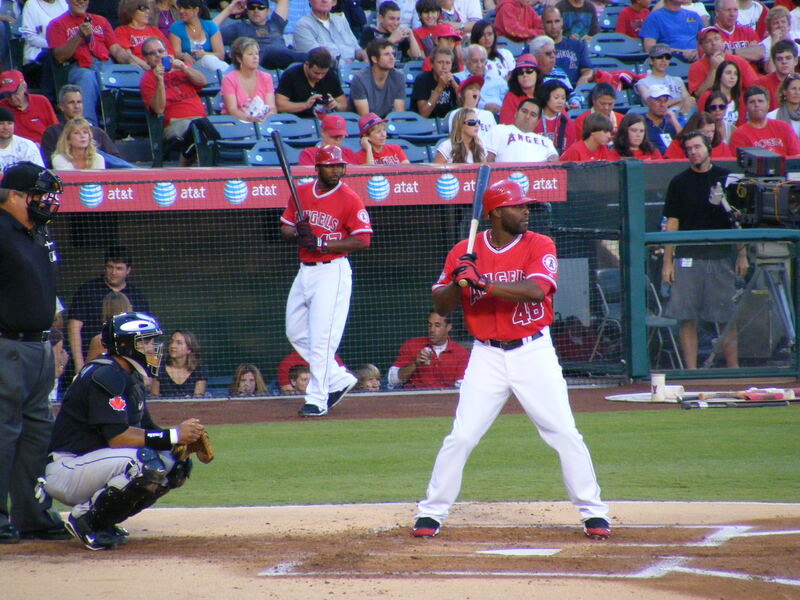 BP kind of died after Jose Bautista, Vernon Wells, and Aaron Hill hit. 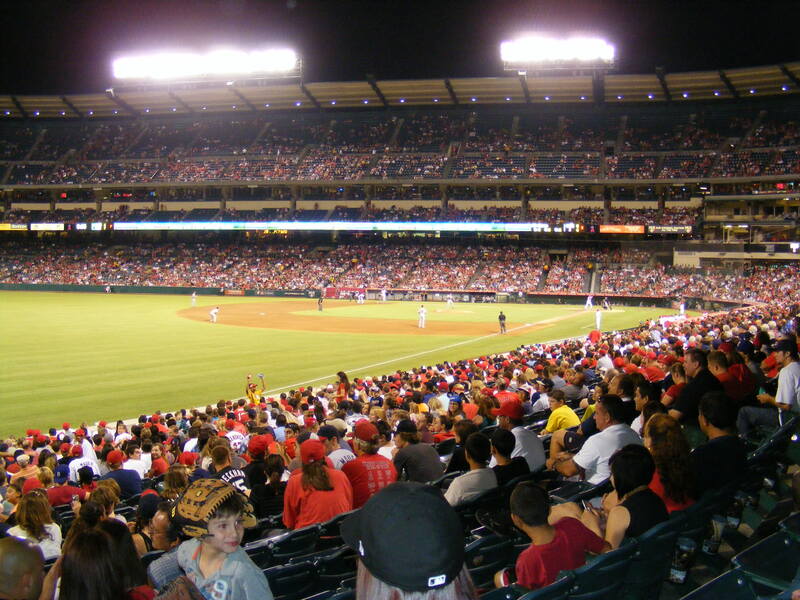 I spent the last round in right field–but didn’t snag anything there. I ran down toward the dugout, passing Michelle and her family in the process (they’d been hanging out in some shaded seats for the end of BP) and when I got to the Blue Jay dugout I got Ball #4 from John MacDonald as he headed into th dugout. It had a cool black smudge on it. BAM! So cool! And we were on the aisle. I told Joe, “These are the seats I have to sneak down to when Michelle and I usually come to games here.” He’d gotten them from someone at his work–so thanks to Joe and the folks he works with! That’s Mike Napoli scoring on a two-run home run by Hideki Matsui. 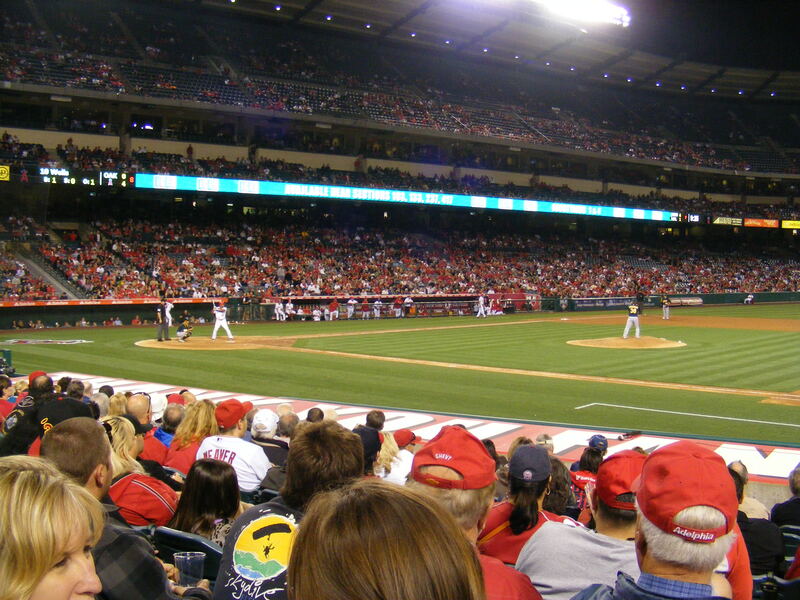 That was in the second inning so the Halos were off to a good start! I was thrilled to be in great seats that were actually OURS! go on to win, 7-2. 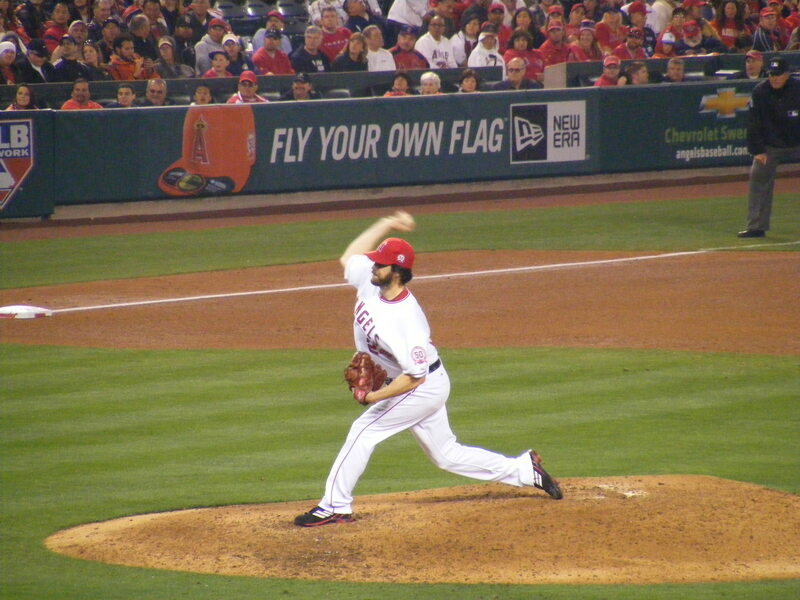 He pitched a scoreless inning. Good for him! And Bobby Wilson, our backup catcher, ended up with two home runs and five RBIs on the night! Wow! 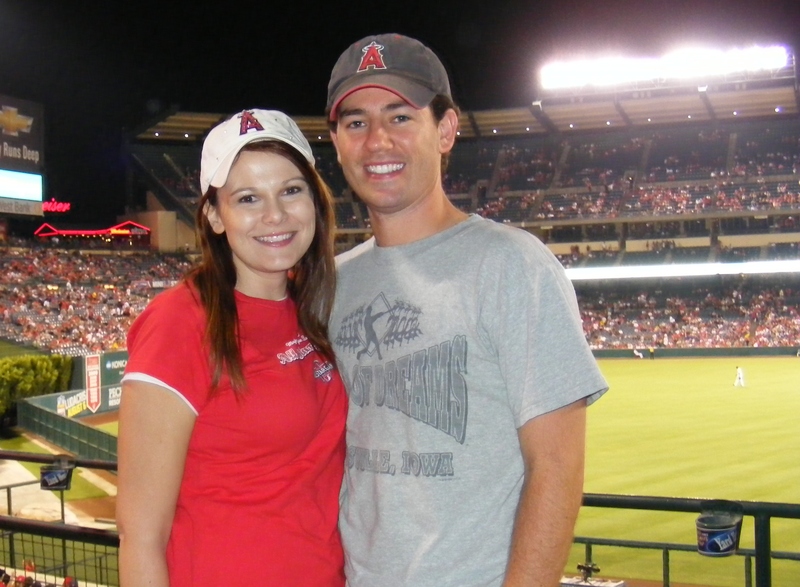 It was a good atmosphere, pleasant company, and a great game to watch. 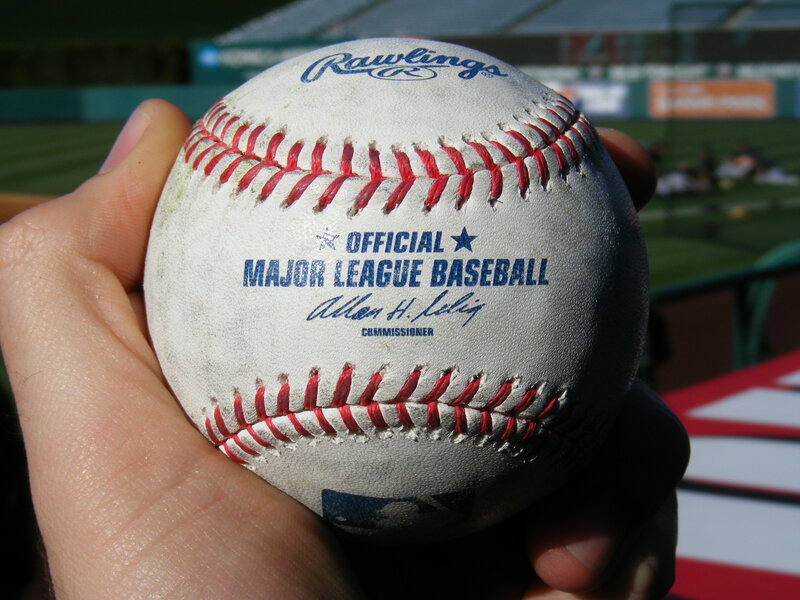 In the ninth inning I positioned myself right over the Blue Jay dugout and as the Jays retreated into the dugout someone (I think it was Shaun Marcum) flipped a ball up over the dugout unexpectedly. 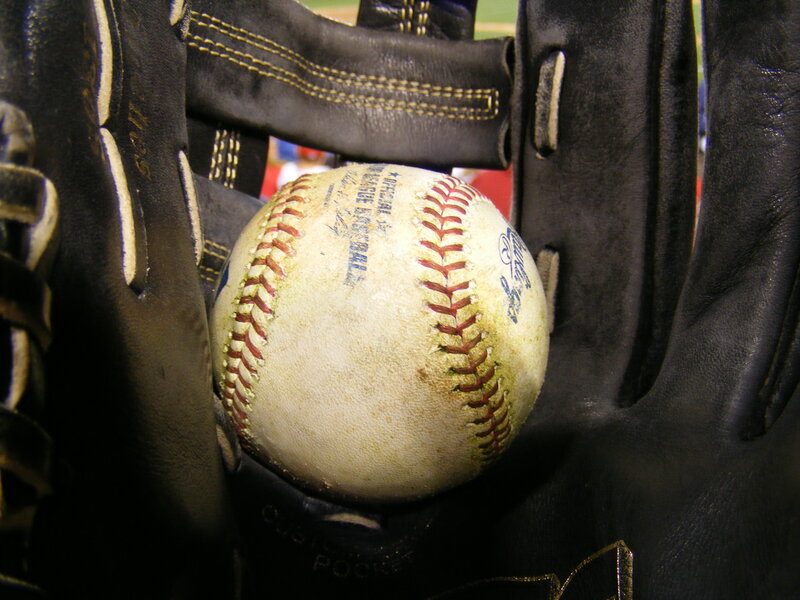 I didn’t catch it in my glove… I caught it with my glove, pinning it against my chest… luckily it didn’t hurt and that gave me five baseballs on the night. A pretty good haul–after we left the stadium we treated Joe and his son, Joey, to frozen yogurt at our favorite place and then they were on their way back home. 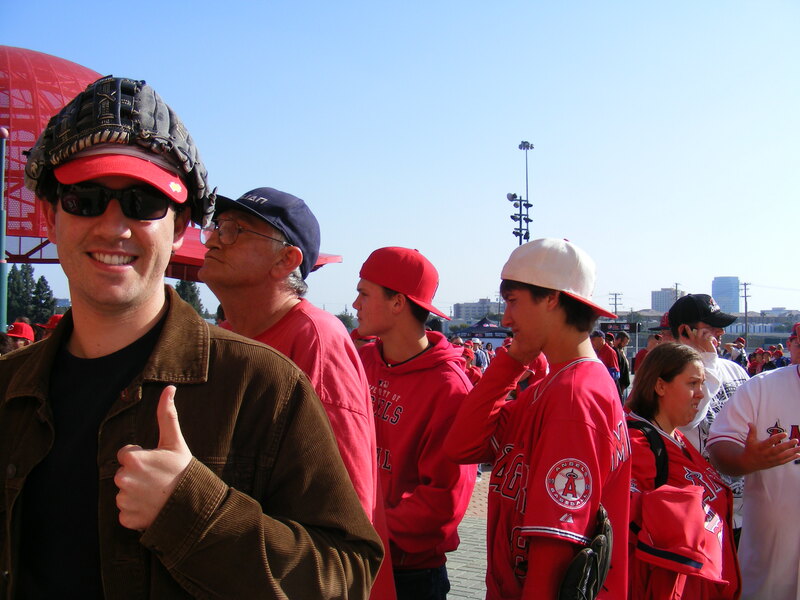 Back home in Orange County and I was off to a day game… after a night game… what? 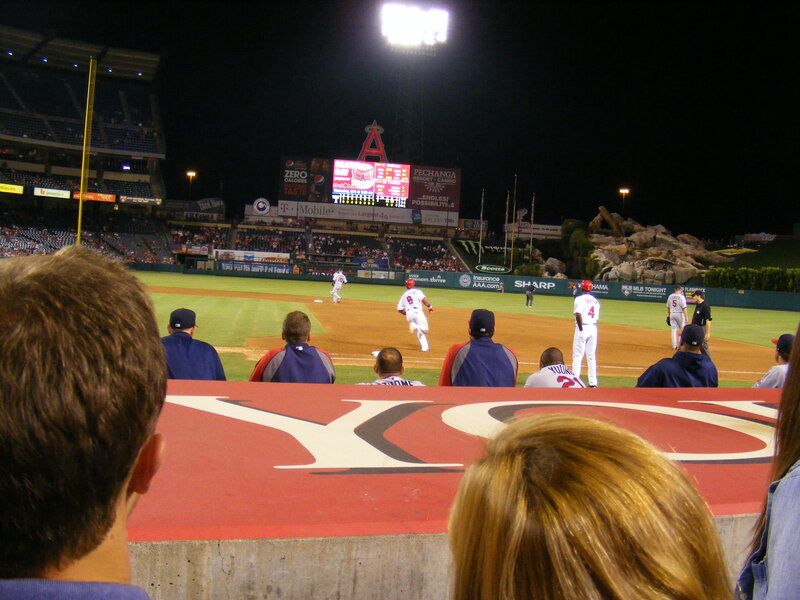 were throwing over on the first base side of the stadium. 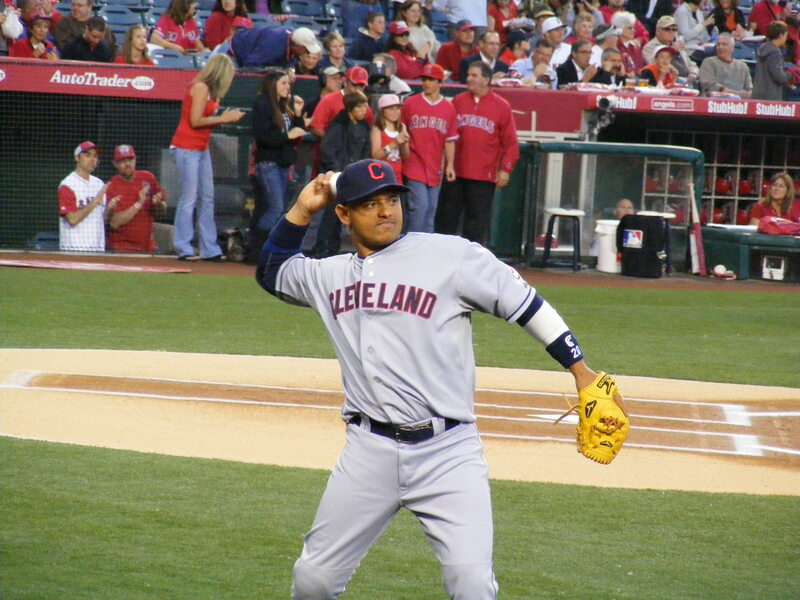 headed back toward the dugout I held up my glove and said, “Mike! I recognized Wilson Betemit and saw him with a bat in his hands. first round would slice one toward me. 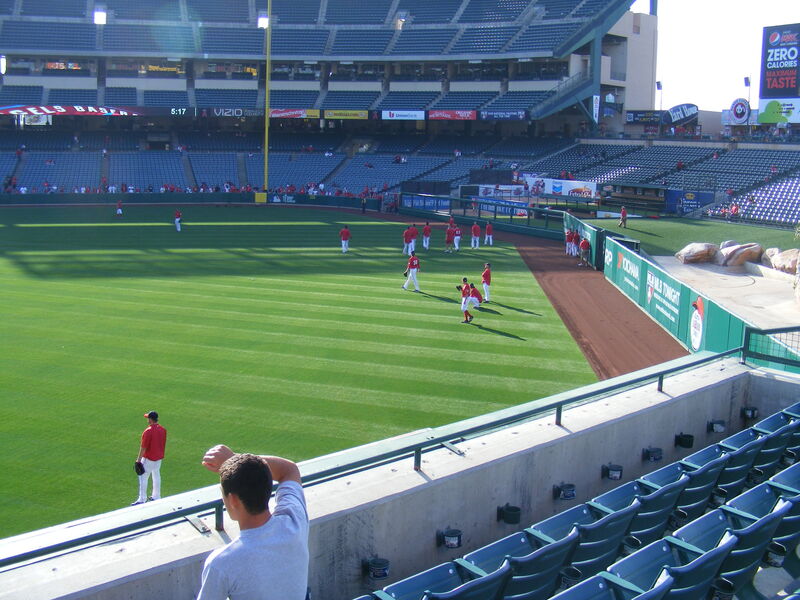 That’s Bruce Chen running–I’d end up getting his autograph on my ticket stub after BP. made the catch on the fly. 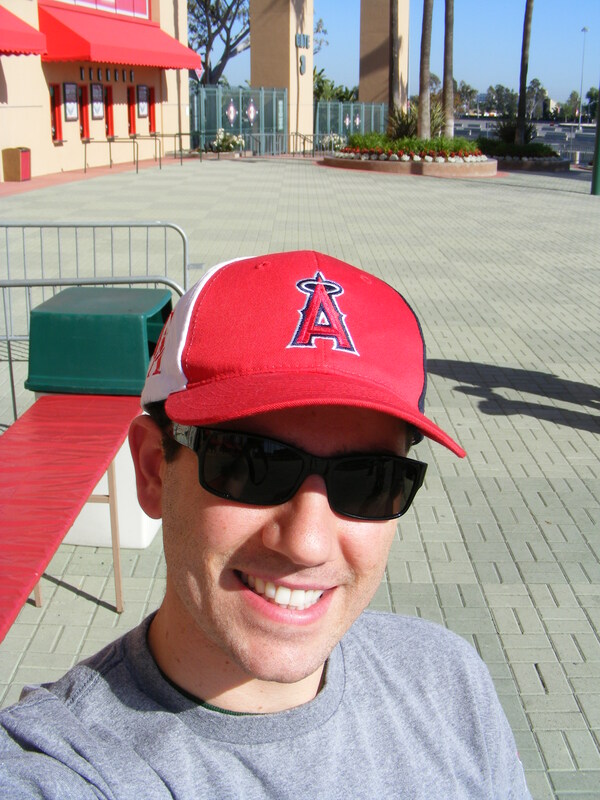 drink and had a seat on the shaded (third base) side of the stadium. 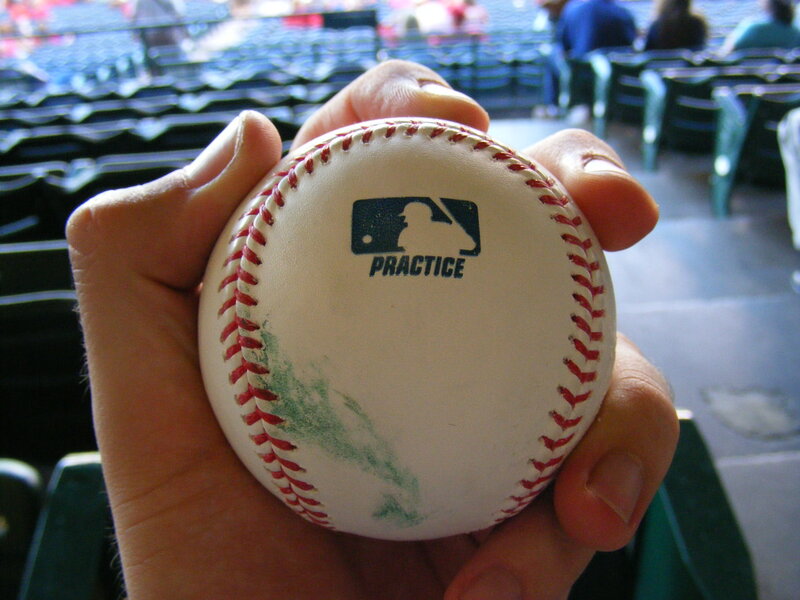 popped back out and tossed be a ball with a gnarly black smudge on it. 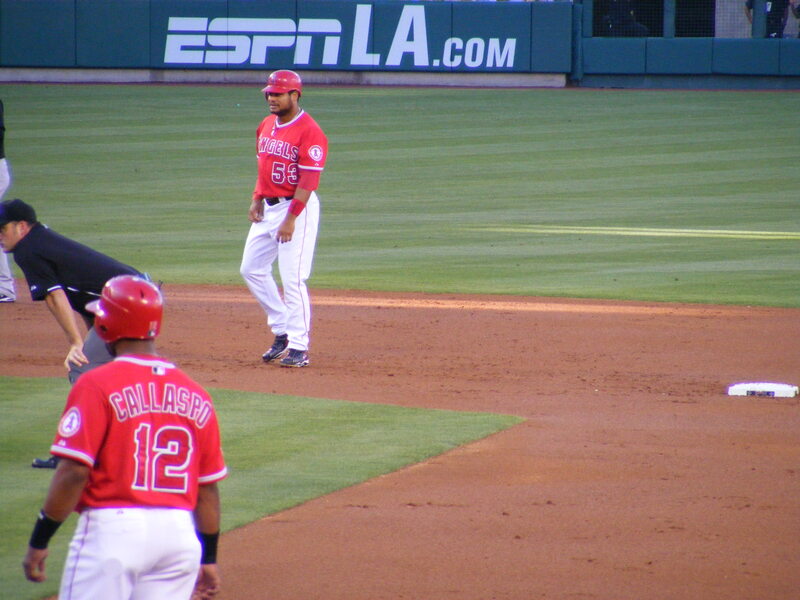 knew the guy’s name who was playing first base for K.C. 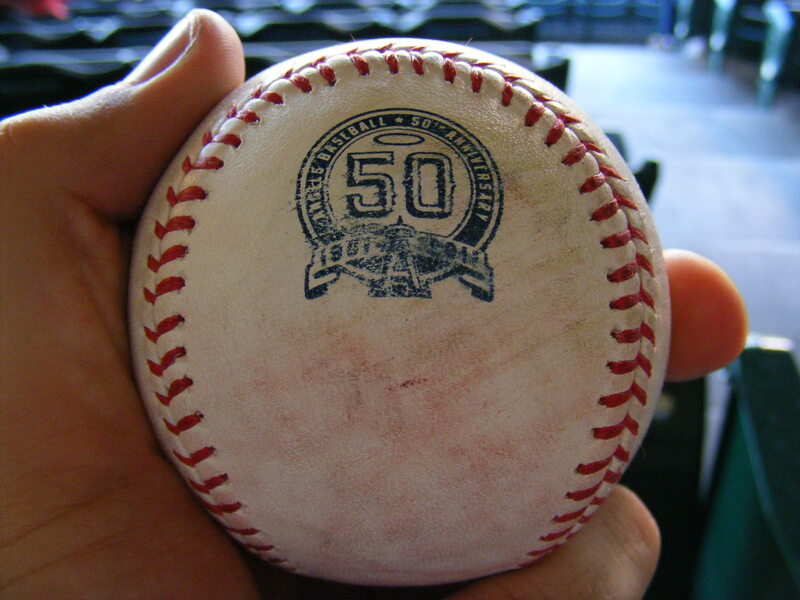 He flipped me the beautiful, rubbed-up ball for my fifth on the day and number 250 overall! With my mini-milestone out of the way I decided to try for another one. lot of home runs… Betancourt hit one to center. That had been it. I had time to take a picture with fellow ballhawk, Rob, who’s on the myGameBalls Lifetime Top 10 list. Oh, no! The wind had been occasionally blowing in… and I watched as the ball lost momentum… I moved down to my original spot… the ball was falling fast. I won’t dwell on it too much–gamers are tough to come by. 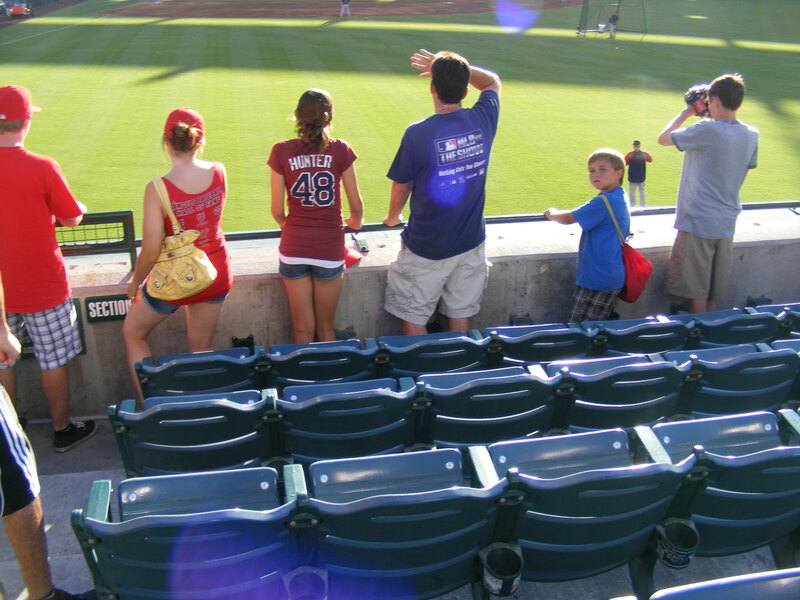 I did snag five balls at a day game following a night game, so that’s good. I did get my 250th ball, so that’s good, too. 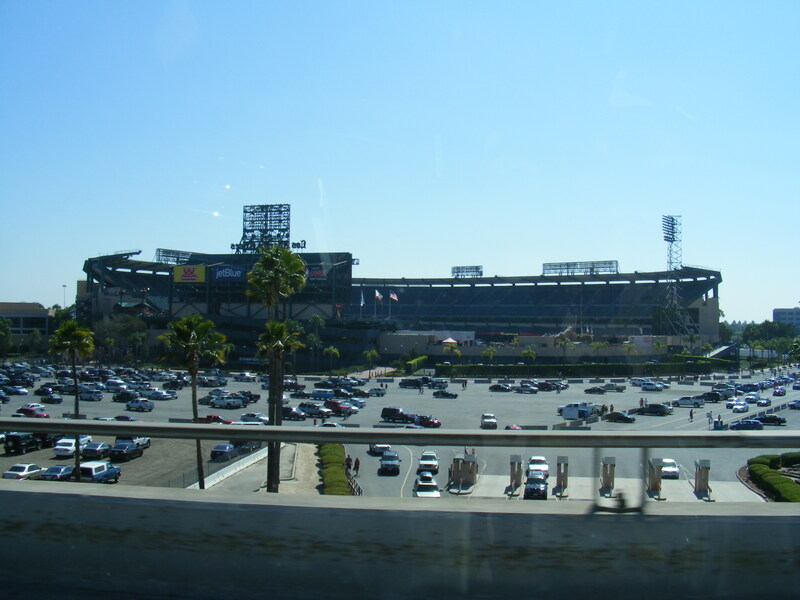 I took a photo while getting on the 57 freeway heading south… on my way home. 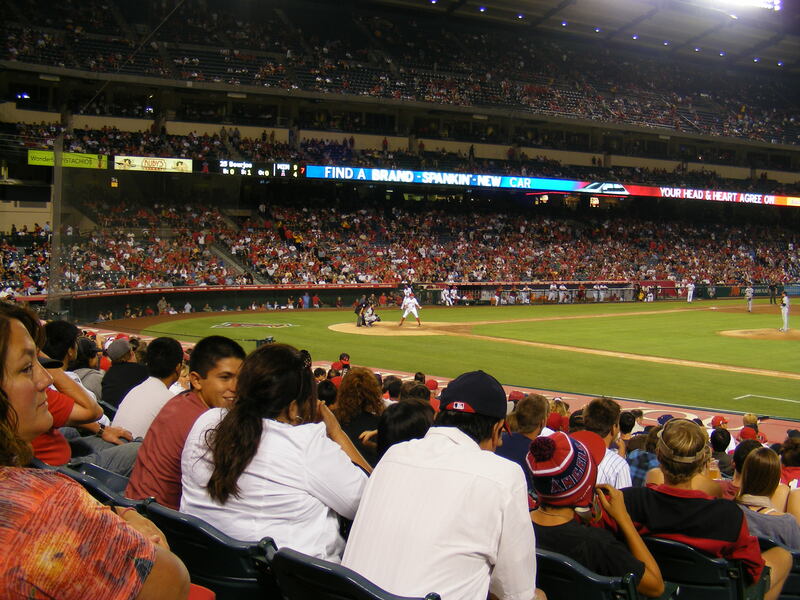 And I’d get to come back to Angel Stadium in just a few more days with Michelle and some family, and we’d have some pretty awesome seats!